Is There A Survivor Benefit Plan Calculator? Every family has a different financial structure. Details can make a huge difference in whether the SBP is right or necessary for you. How much of your total retirement income comes from military retirement pay? Do you have other retirement funds, other income streams, or assets that could be used to provide income? How much will your living costs change if the military retiree passes away? It’s possible that other sources of income will cover estimated living expenses for survivors. In that case, there is no need for SBP. Another option is to cover only a portion of retirement income. SBP pays 55% of the covered amount, called the base amount. The base amount may range from $300 to full retirement pay. While most conversations about SBP are around full retirement pay, selecting a lower amount may be right for your situation. For many families facing retirement, the question is whether to elect the SBP or whether to purchase commercial life insurance. 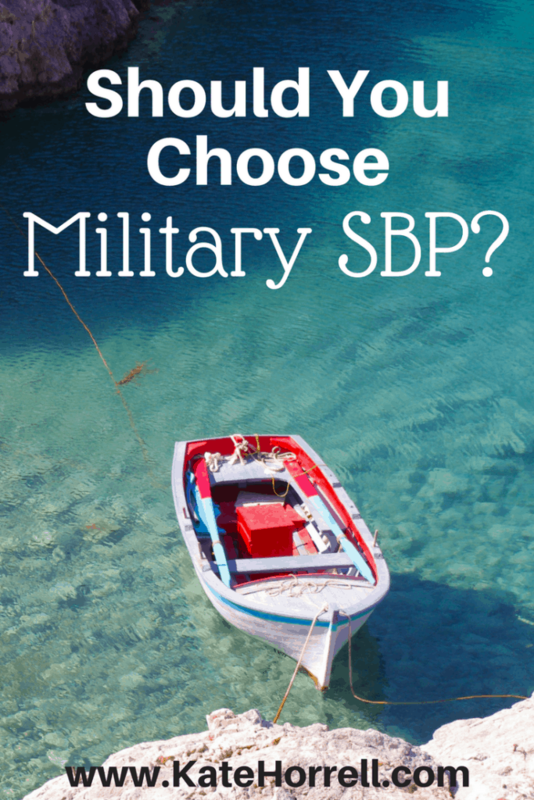 Military retirees are eligible to purchase SBP coverage at retirement regardless of illness, injury, or health history. Depending on your situation, this can be invaluable. Many military retirees are unable to purchase affordable life insurance on the open market. Even worse, some can’t purchase it at all because of their health situation. If you are looking at life insurance instead of the SBP, be sure to explore your insurability before making a decision. Obviously, none of us can guess how long we’re going to live. If we could, the SBP decision would be a lot easier. We can, however, make some educated guesses, using actuarily tables, family history, and health factors. The decision to select SBP coverage is more logical if you expect the surviving spouse to live long after the death of the military retiree. If you’re deciding between commercial life insurance and SBP coverage, taxes may be a consideration. SBP premiums are paid with pre-tax dollars, saving money during the premium payment phase of the process. SBP benefits are taxable to the beneficiary after the service member’s death. Commercial life insurance is paid with money that has already been taxed, but the benefits tax-free. The benefit of one versus the other will depend on your individual factors, particularly the tax bracket you are in during the premium payment phase versus the benefit payment phase of the policy. Under the SBP, you have the option to provide coverage for children, either separately or in conjunction with spouse coverage. This would provide SBP payments until age 18, or 22 if a full-time student. A child who is disabled and incapable of self-support remains eligible if the disability occurred before age 18 (or before age 22 if a full-time student). Marriage at any age will terminate a child’s eligibility. Many people initially think that they will skip child coverage because the surviving parent will be covered, but look at the costs before making a decision. Child-only SBP coverage is quite inexpensive, but adding children to SBP spouse coverage is incredibly cheap. We’re talking pennies per month. If you are electing spouse SBP, it is definitely cost-effective to add child coverage. If you have a disabled child, then the choice to elect SBP coverage on your children is fairly obvious. Disabled children may continue to receive those inflation-adjusted benefits for their lifetime, provided they remain unable to support themselves and do not marry. SBP benefits may be paid into a Special Needs Trust, allowing the child to continue to receive needs-based government benefits. SBP benefits are offset (reduced) by the amount Dependency and Indemnity Compensation (DIC) benefits received from the Department of Veterans Affairs (VA.) DIC is a monetary benefit paid to eligible survivors of service members who died in the line of duty, or eligible survivors of veterans whose death resulted from a service-related injury or disease. For purposes of the SBP discussion, DIC may be payable if the retiree dies from an injury or illness “deemed to be related to military service,” or if the retiree was rated as totally disabled for at least ten years immediately prior to the death, or continuous since the end of active duty and for at least five years prior to the death. If your SBP benefit is less than the DIC amount, then the entire amount of SBP may be offset. If eligible, the beneficiary will receive the full DIC payment regardless of the amount of SBP offset. In addition, the DIC benefit is non-taxable, providing a higher net income than an equal amount of SBP benefit. If your SBP benefit is more than the amount of DIC, you will receive both DIC and the amount of SBP that remains after the DIC offset. The two benefits will total the income of the elected SBP coverage, but the DIC portion will be tax-free, resulting in a higher net income. Understanding the SBP-DIC offset may impact your decision regarding SBP. You will have to consider not only the likelihood of survivors receiving DIC benefits, but also the amount of DIC for which they would be eligible vs. the amount of SBP benefits you’re purchasing. Beneficiaries who have their SBP payments reduced due to the receipt of DIC benefits will receive a pro-rated refund of premiums paid into the SBP program. If a SBP recipient remarries prior to age 55, SBP payment stop. They may be restarted if the subsequent marriage ends due to death, divorce, or annulment (pretty much any reason.) A friend of mine falls into this category, and she has successfully had her benefits reinstated. If a SBP recipient remarries after age 55, there is no change to his or her benefits. Obviously, you can’t guess whether a surviving spouse will remarry, but you can know some things. First, how old are both parties when choosing whether or not to elect SBP? If the spouse is closer to age 55, the chance of there being a death and subsequent marriage before that cutoff decrease. Also, does the spouse have any religious or cultural beliefs that would increase or decrease the chances of remarriage? These may be clues as to whether a surviving spouse may remarry, and when. While SBP elections are generally irrevocable unless there is a qualifying life event, there is one window during which an SBP election can be revoked. If you elect SBP coverage at retirement, you may terminate the election between the 25th and 36th month of retirement. If you’re really unsure if you want or need the SBP, it might make sense to elect coverage at retirement, and then re-evaluate during the termination window. You can use those two years to gather more information and complete tasks such as obtaining commercial life insurance and completing the VA disability claims process. If you terminate coverage during this window, you will not receive any refund of premiums paid. Many times, couples break down their SBP decision to straight math. While I absolutely advocate knowing the math, you also have to consider the emotional aspect. The lifetime, cost-of-living adjusted income of SBP may provide peace of mind and security in a way that a one-time life insurance payout can’t. Alternately, you could spend your nights being irritated by the cost of SBP premiums. You may not be able to completely anticipate how you’re going to react, but you might have some ideas. One of the purposes of insurance is provide a sense of security, so be sure that your SBP choice makes you feel good. Every family has a unique set of factors to consider when considering SBP. Think about these ten thingsas they apply to your long-term financial plans and figure out what works best for you and your family. Hi, I came across your helpful post through one of my military feeds, and my husband and I have been discussing these questions since he is nearing retirement eligibility (woo-hoo!). Most of his qualifying years have been as a reservist, so he is not planning to retire at 20. What happens if he should reach retirement eligibility, stay in and then unexpectedly die (unrelated to his Navy duty) before retiring and electing SBP coverage? Would I automatically get that b/c he was over 20? Given all that, SBP is an excellent insurance, especially for someone who has a spouse who depends on the income. You can’t buy a COLA indexed pension/annuity at that rate from an insurance salesman no matter how hard he tries to convince you that you can. Thank you so much for this resource! It is invaluable to many of us military families. Now that my son is 22, and no longer qualified to collect his child only SBP, what happens to all of the money that I contributed to the plan over 20 years? Dear Ben, the premiums you have been paying purchased the coverage you received at that time. Those premiums were invested into the plan to pay claims as they are made. The money remains in the plan to make payments to those who experience a loss. Looking at retirement coming soon. Husband has 34 years in and is 59. I am 56 and retired 12 years ago. I elected SBP based only on the kids since we have 4 and they weren’t even all born yet when I retired. Husband is likely to be 80-100% disabled. If he elects SBP and is 100% disabled, I understand he has to live at least 5 years before I would receive DIC benefits. If he is less than 100% I am reading that I and the kids are not entitled to any DIC benefits. If he’s 80-100% disabled would there be any SBP really to speak of since the bulk of his “retirement” pay would be from the VA? Would he still be paying the same into SBP as if his whole check was from military retirement, or would SBP cost be determined by how much retirement pay he actually gets versus what he gets from the VA. His health and age would make it cost prohibitive to get more life insurance I think. Our youngest is still only 11, so there are a lot of years left raising kids and sending kids to college. Our oldest is only a Freshman now. It seems like electing to take disability pay (less than 100%) would put the family at a financial disadvantage. Am I misunderstanding something? Thank you. Susan, I’d love to help but I’m having difficult interpreting the question. Please feel free to comment back. In the meantime, here is some information that might help you. If you elect SBP, the premium is based upon the entire military retirement pay. However, if survivors do receive DIC payments, there is a pro-rated refund of SBP premiums based upon the portion of SBP that is offset by DIC. The catch is that the SBP refund is not adjusted for inflation, so it has less value than the original premiums paid. In my mind, if you are leaning towards SBP, I wouldn’t NOT take SBP because of the chances that you will receive DIC. The criteria for receiving DIC are pretty clear and not particularly broad. More importantly, even a retiree who truly expects that his survivors would be eligible for DIC may die from a completely unexpected and unrelated causes, and his survivors would not be eligible for DIC. If you pay for SBP, and don’t receive it because of the DIC offset, you will receive a refund of premiums. Yes, the value of the refund will be less that the value of the premiums paid, due to inflation, but I’m OK with that. I see the difference between the current value of the premium cost and the possible refunded value of the premiums as the cost of the the “insurance” for the possibility that death might not be service-related. On the other hand, if you don’t elect SBP because you expect to receive DIC, and the covered retiree dies of a non-service related cause, the survivors don’t have either SBP or DIC. None of this is to say that SBP is the right choice for your particular situation. Only you can decide that based upon the financials and the sleep-at-night factor. Mathematically, SBP makes sense for a lot of people. However, if you have your own military retirement, or other assets and income streams, perhaps SBP is not the right tool for what you need to accomplish. However, if SBP is the right tool for what you need to accomplish, then consider the pros-and-cons of how it interacts with DIC and see if the cost of the SBP premium (possibly refunded) is worth the security of not having to count on DIC eligibility. I know that was a lot, and if it is confusing, please let me know and I’ll try to explain it a different way. Thank you Kate. I think I was had a misconception. If my husband elects SBP and is found 90% disabled and accepts the VA disability check and the reduced retirement check; then he dies. I believe I am not entitled to DIC, but will I get survivors benefits based on what his entire retirement pay would have been had he not taken the disability? We retired and elected SBP, but would like to revoke the plan. However, we just went over 37 months of retirement. Are there any other options in reference to terminating the plan? Please advise. Thank you!! There is no provision to leave SBP after the cancellation window. I’m not an expert and I don’t know your exact situation but I recommend taking full SBP and obtaining Life Insurance. and do all plenty of research during the first 2 years of retirement. Also the VA generally doesn’t rate above 50plus percent disability right out the door unless its permanent and total..missing an arm or leg etc. I am not aVSO but some folks re-open their claims for an increase in rating a few years after retiring. Depending on your claim(which of course I do not know your situation) however don’t be surprised if rated at 0-10 maybe 30 percent on the initial claim at retirement. I was medically retired in Dec 2017 and was rushed through the retirement process. I guess that I elected to pay for SBP due to receiving a bill in the mail today (5 months later). I am currently 90% disables and can no longer afford the premiums. Is it possible for me to cancel the plan or will I be billed against my will? I understand that I can elect to cancel the policy after throwing money away into it for 2 years and in the 3rd year I can cancel. But this is taking $121.00 in food out of my families mouth every month and I can no longer afford it. Please Help. I’m sorry you felt rushed into making (or not making) a decision about SBP. Unfortunately, unless you are 100% disabled, your only option for discontinuing SBP is to wait until the 24th month. I’m honestly not sure what happens if you choose to terminate your SBP coverage while you have an outstanding bill. Without knowing your entire financial situation, I can’t suggest any other solutions. If you’d like to do a complimentary, private one-on-one session with me, please let me know. I’d be glad to try and help you figure this out. I have a question but not sure I want the answer. My husband and I have been married 38 yrs. when he retired we were young and opted out of SBP😐 is there ever an enrollment period that we can enroll even if we need to pay for the years we opted out? Thank you, I kinda figured that. Blessed and have Faith there will be a way. John (72) and Mary (68) were enjoying their well-earned retirement with John’s $4,000 monthly military pension, his $2,200 monthly Social Security benefit and Mary’s $1,100 monthly spousal Social Security benefit. Although John was the healthier of the two, he passed away unexpectedly. Because of a decision they made years before without much forethought — to take the minimum base amount of SBP — Mary now faces the future not with $7,300 in monthly income, but rather a drastically reduced $2,365 per month. How did this happen? The decision to elect the minimum base amount of SBP protection lowered John’s military pension from $4,000 to just $435 per month. In this scenario, Mary would probably elect to continue John’s Social Security benefit and stop receiving her own spousal benefit. This is a dramatic example, but is it realistic to believe that Mary, even with John’s death, can maintain her standard of living with just over one-third of the couple’s previous household income? Even more troublesome, in our scenario Mary is the one in poorer health. She faces a potential need for greater care and medical costs just when her monthly income is significantly reduced. Why would anyone take the risk of creating this kind of situation for their loved one? Sadly, it happens often. The SBP election is arguably the second most important financial decision a servicemember will make, after the decision to “stay or go.” Both decisions can significantly affect the long-term financial security of the servicemember and the family. It is important to remember that military retired pay stops at the death of the retiree. Surviving family members have no further claim to money from the government. Electing the SBP is the only way a retiree can continue a portion of retired pay to survivors. SBP has changed significantly since its inception in 1976. Overall, these changes have been beneficial for servicemembers and their families. Today, SBP pays more and costs less than it did a generation ago. Other changes have been made to the program to improve it, such as a limit on how long a retiree must pay premiums. Unfortunately, there is still a lot of misinformation about the SBP. As a result, important decisions are being made on the basis of an erroneous understanding of the program. SBP coverage begins the day an individual joins the military. During the time the servicemember is on active duty, coverage is free – the government bears the full cost. At retirement, the servicemember has the option to continue full or partial coverage on a cost-sharing basis, or to terminate the protection. In fact, it’s a joint decision, because the spouse has to concur with any election that reduces or terminates the level of protection below full retired pay. The “basic” level of coverage is 55 percent of full retired pay. For this, retirees pay 6.5 percent of retired pay, i.e., that percentage is deducted from their retired pay. Retirees may elect a lesser amount than full retired pay. This is called the “base amount,” and both the premium and the annuity are calculated based on it. For example, a retiree receiving $4,000 monthly, who elected full retired pay as the base amount, would pay a premium of $260 a month. The beneficiary would receive an annuity of $2,200 monthly. If the retiree (with spousal consent) chose a base amount of $3,000, the premium would be $195 a month, and the annuity would be $1,650. The minimum base amount is $300. This costs $7.50 a month, and pays a monthly annuity of $165. Enrollment in the SBP is all but irrevocable. The law does permit withdrawal from SBP (with spousal consent) during a narrow window between the 25th and 36th month after retirement. After that, the retiree will continue to pay the premium until age 70 or 360 payments, whichever is later. Premium payment can be suspended if there is no beneficiary, e.g., the beneficiary spouse predeceases the retiree. Payment also stops when the youngest child becomes ineligible due to age. The SBP offers a number of important advantages. For the servicemember, it is a government-subsidized, inflation-adjusted, level-term annuity paid with pre-tax dollars. Lifestyle and medical factors are not a barrier to enrollment, and the beneficiary cannot outlive the annuity. The SBP provides an income “safety net” for the beneficiary, and peace of mind for both the retiree and the recipient. The SBP does have some negative features. After the 36th month, there is no way to withdraw from the plan. If the beneficiary predeceases the retiree, the premiums are not refunded. The cost is taken out of retired pay, and increases with annual Cost of Living Adjustments. There is no cash value, and the retiree cannot borrow against it. Lastly, there is no residual estate that can be left for heirs. It is important to realize that the SBP replaces just 55 percent of the base amount. Seldom is this sufficient to maintain the beneficiary’s lifestyle. Thus, SBP should be viewed as the foundation of the survivor’s income plan. In most cases, it will need to be supplemented with other sources of income, such as life insurance, investments and Social Security. A Financial Advisor is well-equipped to help sort through these factors and create a sound financial plan for the retiree and the surviving family members. Enrollment in the SBP is the right choice for the majority of retiring servicemembers. There are circumstances when it may not be the best choice, and these should be discussed with your Advisor. Consideration of the SBP should begin early in the career, along with whether to serve a full career in the military. Once the decision is made against the SBP, there is seldom an opportunity for a “do-over.” Therefore, this decision should not be made at the last minute!